The extended cut of "Batman v Superman: Dawn of Justice" includes 30 more minutes of story and action not seen in theaters! Also includes the Theatrical Version of the film plus over 2 hours of bonus content. From director Zack Snyder comes "Batman v Superman: Dawn of Justice," starring Ben Affleck as Batman/Bruce Wayne and Henry Cavill as Superman/Clark Kent in the characters' first big-screen pairing. 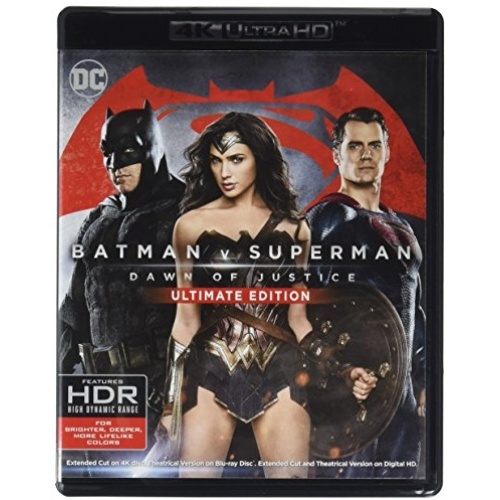 Fearing the actions of a god-like Super Hero left unchecked, Gotham City's own formidable, forceful vigilante takes on Metropolis's most revered, modern-day savior, while the world wrestles with what sort of hero it really needs. And with Batman and Superman at war with one another, a new threat quickly arises, putting mankind in greater danger than it's ever known before.